You will need to set the extruder calibration on your 3D printer. Before you can calculate the last value, you need to ensure that the correct amount of plastic is extruded for a set extruder distance, perform a simple test extrusion, measure the results, and calculate the change. Don’t worry — it’s not difficult. This extruder calibration is really important. It ensures that the firmware knows exactly how much material is being deposited, and that Slic3r can rely on your machine for accurate calculations when producing the G-code to print objects. Pay particular attention to the fourth number in the list; it specifies how many steps the extruder motor uses to feed 1mm of filament into the hot-end. You can extrude and reverse the extruder, but only when it’s up to temperature. This manual control is essential for loading and removing filament, and for purging any old material. In Pronterface, you can command the extruder to extrude or reverse the stepper motor a set distance (specified in millimeters, as shown in the bottom-left corner. No need to heat your heated-bed for this calibration. When the hot-end is at temperature, insert the filament. Pushing down and using the Extrude button in Pronterface about 5mm at a time should grip and drive the filament into your extruder. At this point, if you notice the extruder stalling or spinning around and attempting to drive what looks like a lot more than 5mm you may need to simply lower the number in the firmware just so you can calibrate more accurately. Depending on the type of extruder, the type of gearing it has, the electronics that were selected for it, and the way the micro-step value was set, the steps-per-unit value should be somewhere between 50 and 1100. If you’re using 200-step-per-revolution motors with 16x micro-stepping, one rotation would be set at 3200 steps. One full rotation usually drives a significant amount of filament into your extruder, so if you don’t have any other advice about your extruder, try using a number around 200 for the first test. Mark the filament: Wrap a strip of tape or a sticker to the incoming filament at a distance of about 50mm from the extruder’s filament-entry hole. Measure the exact distance between the mark you’ve just made and the extruder body before and after extruding 20mm of filament. Write this number down. As a working example, say it was 48mm between the mark and the extruder body. The best way to measure this is with a digital micrometer, another very good tool for 3D printing. A digital micrometer can help you in many ways, including (a) checking whether your printed parts come out as they were designed and (b) in measuring the filament diameter of different coils for setting in Slic3r. Extrude 20mm of plastic filament in 5mm steps, with a delay of a few seconds between steps. The delay is to ensure that you don’t extrude too fast; it reduces the risk of the motor skipping. You should have had a smooth motion of filament driven down into your hot-end and extruded out. 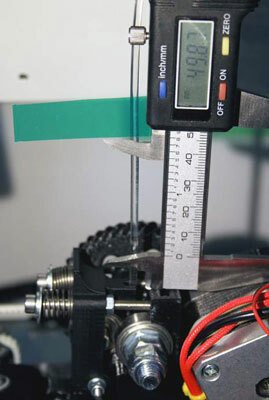 Measure the new distance of the gap between the mark and the extruder as you did before. If your extruder was ideally calibrated, the new remaining distance (in this instance) would be 28mm. Chances are, however, that this new gap size is either bigger or smaller than 28mm. Say that you actually measured 32mm, meaning that the extruder actually drove the filament only a distance of 16mm instead of the 20mm you expected. 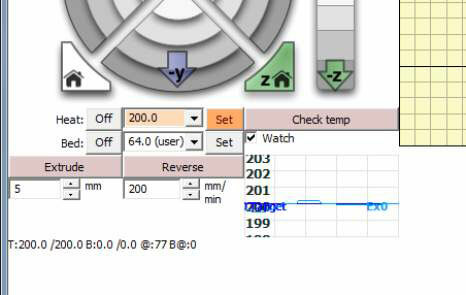 We now use the existing number of extruder steps per unit in our firmware, and the distance extruded, which in this case was 20mm, to calculate the number of motor steps your firmware just moved. Because 200 x 20 = 4,000, this is the number of motor steps your firmware moved for the 20mm of extruder motion you set. Since you achieved only 16mm of movement, however, you can calculate our actual steps-per-unit value by dividing that 4,000 by 16 to get 250. The same calculation can be made if you found the number was higher than 20. The result will just be lower than the 200 steps. Enter the new steps-per-unit value in the firmware. If you enter the change in the extruder’s steps-per-unit value in our firmware from 200 to 250, you achieve the 20mm of movement the next time you perform this operation. After updating your firmware with these changes, you’re ready to print your first 3D object. Be sure you routinely check to ensure that your 3D printer hasn’t been knocked out of alignment and that your hot-end is still a suitable distance away from the build-bed before you print. Fortunately, you don’t need to calibrate the temperature of your hot-end and do extruder calibration every time you print; you’ve entered these values into your firmware, and such settings don’t require constant adjustment.